Sandhani Life Insurance Co. Ltd Job Circular 2019 has been published in daily newspaper. We collect the job circular and finally include in our website private job category for the peoples. To found Sandhani Life Insurance Co. Ltd Job Circular 2019 all information from www.bdjobscareers.comFor your information, the andhani Life Insurance Co.Ltd. SLIC is one of the leading Life Insurance Company in Bangladesh since 1990. Clients are the spirit of our business. Well, good news is that, recently the organization looking various positions new job holder for their organization empty vacancy. 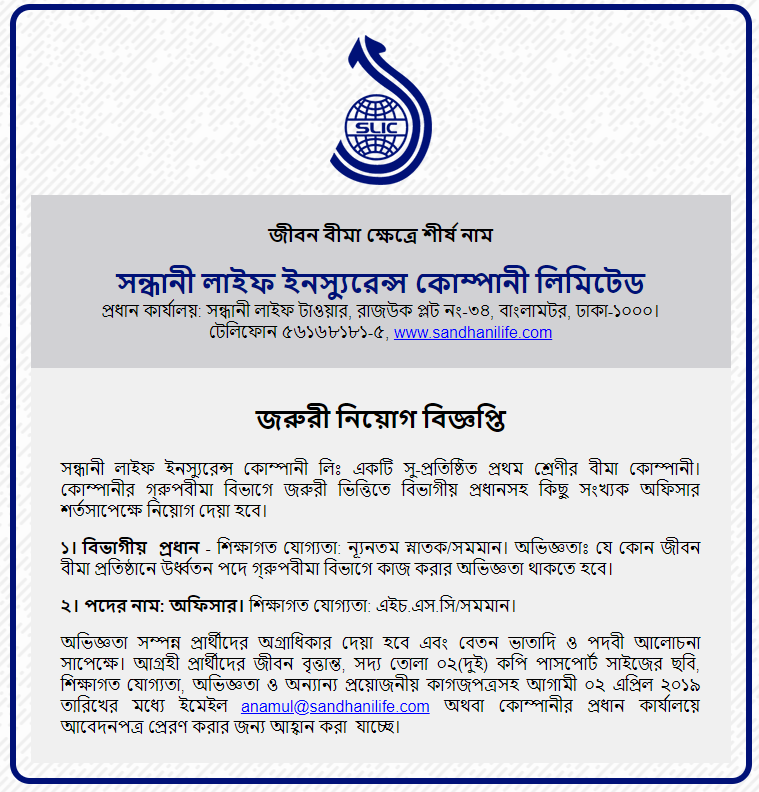 For the user help, we have already given this job all of the necessary details such as published date, application deadline, job circular image, educational qualification, applying procedure and more. However, if you are interested in private organization jobs in Bangladesh, you can check this job, details and apply now!! This entry was posted in All Jobs, Bangladesh Pratidin, Chittagong Jobs, Newspaper Jobs, Private Job, SSC Pass Jobs by admin. Bookmark the permalink.